Most adults (66%) expect to spend less than last year on gifts this holiday season, according to the latest Rasmussen Reports national telephone survey. If you’re one of them (and I am), there are plenty of ways to please your friends and loved ones this season without emptying your wallet. Here, 15 tips for spending less on holiday shopping. 1. Make It Yourself: A time-honored tradition for thrifty gifting. If you sew or do woodworking, this is a natural, but think outside the box. You have a computer – so use it. Create calendars, photos, slide shows or scrapbooks using your own pictures or publicly available ones, such as those from Public Domain Photos or Flickr.com. Make mix CD’s with custom-made labels; iTunes makes it really easy and it’s free at: iTunes. For other craft ideas, try Family Fun or Strecher.com. 3. Subscribe to your local mall or outlet store’s e-mail newsletter. You’ll be alerted to upcoming sales and may receive e-mail coupons you can use. 4. Get even better deals at outlet stores: Go to their website to print out coupons or sign up for their customer club to receive email discounts. 5. Drugstore deals: CVS Extra Bucks and Rite Aid Single Check Rebates are just a couple of examples. Walgreens has some outstanding deals too. If you plan carefully, you can get items for free or nearly free. Go to CVS.com, riteaid.com and Walgreens.com to see their specials. For more advice on how to work the CVS deals, I recommend www.iheartcvs.com. Also see our Drugstore.com coupons when you buy online. 6. Ask for a refund if prices fall after you’ve made a purchase. Many stores will provide one if the cost of an item you bought there drops within a specific time period. 7. Company Perks: Many retailers offer special savings to employees of certain companies and government agencies. Be sure to ask. For example, Apple products are discounted for government employees and teachers. 8. E-Cards: Maybe not as satisfying as one you can put on your mantel, but still, better than nothing. I send e-greeting cards to business acquaintances and get positive responses. Find some nice ones at Hallmark.com. 9. Family strategies: With your own family, be hone st. Tell them in advance that you are on a tight budget this year. Then they won’t be surprised to see that their gift is from the dollar store. Possibly your family members are also feeling the pinch and they might be willing to agree that everyone sticks to a small budget. Another strategy is to buy a gift for a whole family unit instead of for every member. For example, a married couple could receive a bottle of wine to share. 10. Friends and co-workers: A clear solution is the classic Polyanna or Secret Santa. Put everyone’s names in a hat and you each draw a name. That way, you only buy that one person a gift instead of having to shop for everyone in the group. 11. Hit the thrift shops: You’ll be amazed at the cool and unique stuff you can pick up cheap – vintage clothes, collectibles, jewelry and more. 12. Give services: A busy mom will love to get some babysitting or house cleaning. A stressed-out, disorganized professional might like their office straightened up. Then there’s pet sitting, plant car e, picking up dry cleaning, etc. Just be sure you really will commit to doing these things. Set up a service date right away so the recipient doesn’t think you’re just trying to get out of giving anything. 13. The Not-So-Dreaded Regifting: Yes, regifting can be horribly tacky. I don’t recommend trying to foist a hideous unwanted piece of dreck on someone you like. That’s not right. But – if you’ve received an actual nice gift that you just can’t use, and it’s in new condition, then go ahead and wrap it up for someone who might really appreciate it. Just make sure to remove the card with your name on it! 14. 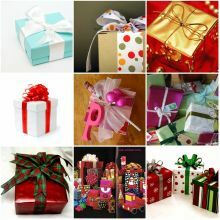 Team Up: Instead of shouldering the gift budget all by yourself, find some friends or family members and give gifts from ‘us’. This is obvious if you’re married or living with someone, but who’s to say you can’t do it with your siblings, parents or best buddies? 15. Send Long-Distance Love: If you have family or friends far away, the one thing they want most is YOU. Use your webcam if you have one, or find someone with a video camera, and video yourself. If you have any musical or dancing talents, go fo r it. If not, you can just talk and tell stories, and maybe have some props at the ready, like the award you got at work, or your new pet. Another quick holiday shopping tip is to do your holiday shopping online. Online stores are having great holiday sales too, and I have been getting killer deals. And here is the best part, if you do decide to do your shopping online, you can download a toolbar from give2network.com, and link it to your favorite charity. Then when you do any shopping from the toolbar a percentage of the money you spend will be given to the charity you picked. I love this idea, and it makes me feel good that I am helping even more people with my holiday gifts.